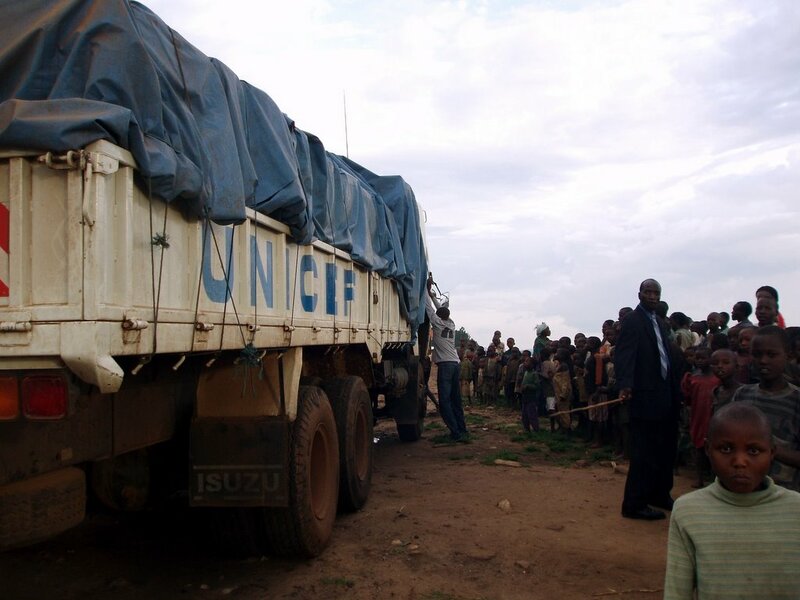 But grace comes in the most unexpected of times and places – (hence the word “grace”) and about 4PM a *huge* UNICEF truck comes roaring into the camp trailed by the requisite entourage of children running behind. I had written a letter to the UNICEF health division a few weeks back after their education staff had visited the camp. I hadn’t heard back so I tried emailing the same letter to the education staff member that had given me his card. Still no reply so I had pretty written them off as unable or unwilling to help… then in another moment of grace I was having lunch with Andria, a Canadian UNHCR intern (specifically in HIV concerns) at the Novetel when I was back in Kigali when lo and behold a UNICEF physician comes to our table to greet Andria. I am introduced and immediately (perhaps a little too enthusiastically) jump straight to business – asking her if she has seen my letter… she says no, but gives me her card and encourages me to email a copy to her so she can forward it to the head of the health division. I do later that night and invite the head of the division to come visit the camp. Later that week, Kofi who is a Togolese physician – head of the Rwandese UNICEF health division shows up at the camp. He is a large man who speaks his mind directly and forcefully – it is refreshing after being frustrated with the Rwandese penchant for circular pronouncements. Although after his visit he said he couldn’t *promise* anything, UNICEF was shifting warehouses in Kigali and he stated that he should have some things that could help. The next weekend we are back in Kigali and Theo and I call Kofi and visit him at his residence – and he says he has signed a requisition for a huge amount of supplies – 4,500 blankets; 4,500 jerry cans, educational kits, recreation kits, health kits… and we should be expecting them early in the week. As the week goes by I have to admit I had my doubts (I’ve become a little jaded with all the unkept promises I’ve been hearing) and Thursday arrived still without the truck. But come Thursday evening, Thanksgiving just when I am mired in self-pity and frustrations here comes this massive truck filled with supplies and suddenly I am thrilled. There are 2,000 tablets of quinine in addition to a huge amount of recreational equipment and school equipment for the children as well as medical / surgical supplies, It is a gift at just the right time for the refugees and just as quickly as the weather changes here – my spirits are lifted and I am energized enough to help unload the truck (which causes quite a stir among the refugees). I am constantly amazed at how and where help comes – just when I feel like despairing there always seems to be an opening that allows us to slide by again… *grace*. Now if I were *really* African, I would have been able to balance the box without any hands! We are so proud of you and we pray God continue to guide you and keep you safe and healthy to do your great work for the refugees. Thank you! It is not easy, but we pray God give you the strength to overcome all the problems. You are a great human being! Of course, you are our dear daughter, we are so proud to have you. Thanks to God! I was worried that you were getting bitter-- what a great intervention!! Keep the faith or "Semper Fidelis" as we Marines like to say! -- we'll see you in a few weeks. hey ann,your just like the energizer bunny, you just keep on going,and good for those less fortunate people you are helping there! thanksgiving morning seems to have started out bathed in exhausion, loneliness,& possibly self doubt,(not to mention a strong desire for turkey,stuffing & mashed potatoes!). but i know you kept the faith and along came a UNICEF truck filled with all sorts of goodies for you and your new family. AND, THERE IS A GOD! !you are doing so much good, and i know they appreciate it, and will miss you after your gone. keep your spirits up, the glass is always 1/2 full. we miss you over here in chelsea,but we also know you've got alot of doctoring knowledge to spread around to the less blessed,than us. sooo! you go girl!! hopefully, some of us will get to see you during your 2 days in boston,if i'm not able to, have great holidays with your family,and do keep us posted on your adventures and good works. p.s. i can only imagine what your going away party will be like,you will be sorely missed!!! I came across with your blog, and you don't know how much you have been a blessing to me. I was at that camp three years ago, visiting children at the camp. You are doing so much for those children. Our team(mostly Korean American students from San Francisco area), visited there and showed "Jesus" movie, and played with children. I can't imagine how you could live in that place for six months, it has to be your strong faith and your love for God. We have campus ministry in Butare, and my husband is there right now. I mentioned about you to my husband, and I am praying for you. I refered to this blog to one of my student who is interested in a medical mission. Thank you for your inspiration.